SECOND World War designs for a railway crossing beside the Forth Bridge have been discovered. Engineers believe the triple-arch structure was planned as a replacement for the bridge if it had been destroyed by a German bombing raid. The find was confirmed as genuine by Forth Bridge owner Network Rail yesterday – hours after VisitScotland had based an April Fool on the scheme, claiming it would be built. Two engineering drawings were unearthed in a microfiche file during research for the planned Forth Bridge visitor centre. They are dated January 1945 and labelled as “Engineers Department Edinburgh”. The design shows the arches would be 110m high – the same as the existing rail bridge, with 70m masonry towers. Network Rail said the plans could have been prepared in case the bridge was attacked. However, it downplayed suggestions that V2 rockets could have been deployed because they would have been unable to reach the Forth from continental Europe. Ian Heigh, a senior project manager, who is developing the visitor centre proposals, said: “It’s amazing that a 126-year-old structure like the Forth Bridge can still offer us new mysteries. “These plans date from early 1945, towards the end of the Second World War, so we think they may have been drawn up as a contingency plan in the event of a strike. 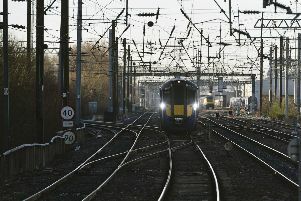 “Even Network Rail’s longest serving railway engineers seem to be a bit perplexed by the true purpose of these proposals. If this bridge had been built, the entire character of the area would have altered, not just the famous landmark. “We’d love to know more about these plans, so I’d encourage anyone with more information to get in touch. VisitScotland chief executive Malcolm Roughead said: “Everyone loves a good mystery, and this one has the experts stumped. “It seems very appropriate that designs for a Forth bridge that might have been have surfaced during Scotland’s Year of Innovation, Architecture and Design, and in a year that will also see the opening of the Queensferry Crossing. The Luftwaffe’s first raid on Britain took place over the Forth Bridge in October 1939, although the target was naval vessels in nearby Rosyth. Network Rail plans to build a viewing platform on top of the bridge. The £15 million project also includes a visitor centre and supervised bridge climbs, similar to those on the Sydney Harbour Bridge. The plans were due to have been at least partially completed by the bridge’s 125th birthday last year, but are still seeking funding. This has been hampered by changes to the structure of the organisation, which has made the scheme less of a priority.